Happy workers are productive workers. But how do you motivate a group of employees to work hard and help your business grow? As a small business owner, it is essential that your employees are being as productive as possible for your brand. The following three are my top strategies for motivating my employees. Every employee is unique and therefore what motivates them is also unique. By assuming that every employee is motivated by the same type of praise or reward, you are shooting yourself in the foot. You need to recognize that everyone is motivated by something a little bit different, and then use that specific type of motivation. How do you know what motivates your employees? You can give each employee a drawing of an empty circle and tells them to divvy it up according to their personal priorities. Sixty percent might be personal development, twenty percent recognition, and twenty percent compensation, for example. If you truly want to motivate your employees, you need to empower them. Ask for their input and suggestions on how they can improve their own performance. This is the biggest form of empowerment. Most employees have ideas about ways they can be more efficient and effective in their work but they may be hesitant to share them with you unless you specifically ask them. Make use of regular employee reviews to discuss in detail areas of strength and areas that could use improvement. Employees are motivated intrinsically when they know they are working toward a larger goal. If they are under the impression that there’s no opportunity for advancement, they will not work as hard as they can. Motivate your employees by offering different types of opportunities to advance. Offer them training sessions that will equip them with the skills needed to advance. This way, even if no promotions are available at the time, employees know they are building their professional resume through workshops and trainings. Motivation is the key to productivity. 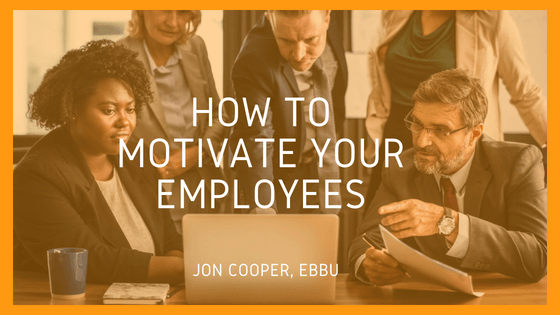 What are some of the best ways to motivate your employees? First, you must customize the motivation to each employee. No two people are motivated by the same things. Next, be sure to empower your employees. To do this you must ask for their input and their feedback and be sure they know that their voice is important. Lastly, continue to offer opportunities for advancement. Even if this is through training sessions, it is crucial that employees are able to see the bigger picture and understand what they are working towards on a daily basis. If you can effectively motivate your employees, your company will be better off for it!